In 1868-69, domains loyal to the Tokugawa bakufu failed to quash a revolt launched by Satsuma, Choshu, and their allies reputedly to restore sovereign power to the emperor and imperial court. Foremost among bakufu defenders was Aizu. Its samurai men and women accounted for 65 per cent of all battle deaths on the losing Tokugawa side, and 38 percent of all troops on both sides, in the Restoration war. As well, scores of Aizu women and boys committed seppuku rather than surrender. Popular accounts hold that, amid the ubiquitous fence-sitting and shameless side-switching in both camps, Aizu samurai alone held steadfast to honor without guile, only to be demonized as traitors to the emperor under the new regime. Latter-day sympathizers eulogized this unyielding fidelity and propagated it as “Aizu bushido”—an ethos to reform Japanese society along desirable lines. 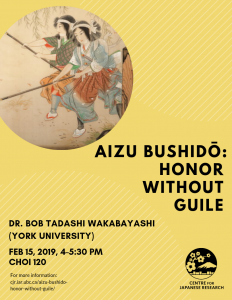 Bob Tadashi Wakabayashi is Professor Emeritus at York University. His work has ranged from Tokugawa intellectual history to Japanese war crimes. Major publications include Anti-Foreignism and Western Learning in Early-Modern Japan (Cambridge: Harvard University Press, 1986), Japanese Loyalism Reconstrued (Honolulu: University of Hawai’i Press, 1995), Opium Regimes: China, Britain, and Japan, 1839-1952 (Berkeley: University of California Press, 2000), co-edited with Timothy Brook; and The Nanking Atrocity: Complicating the Picture (New York: Berghahn Books, 2nd edition 2017).